The overwhelming success of the ballot measures in Democracy Initiative’s priority states is only part of a greater win for democracy on November 6. In California, Colorado, Florida, Nevada, New Mexico, North Dakota, Utah, and more, voters rallied to pass democracy measures that expanded access to the ballot, drew fairer and independent voting maps, and strengthened money-in-politics and ethics regulations. Despite the dangerous rhetoric, voter suppression, and untold amounts of dark money flowing into elections, everyday American people voted and fought back (read the DI statement here). "It is clear when you put democracy reforms on the ballot, those measures win overwhelmingly." 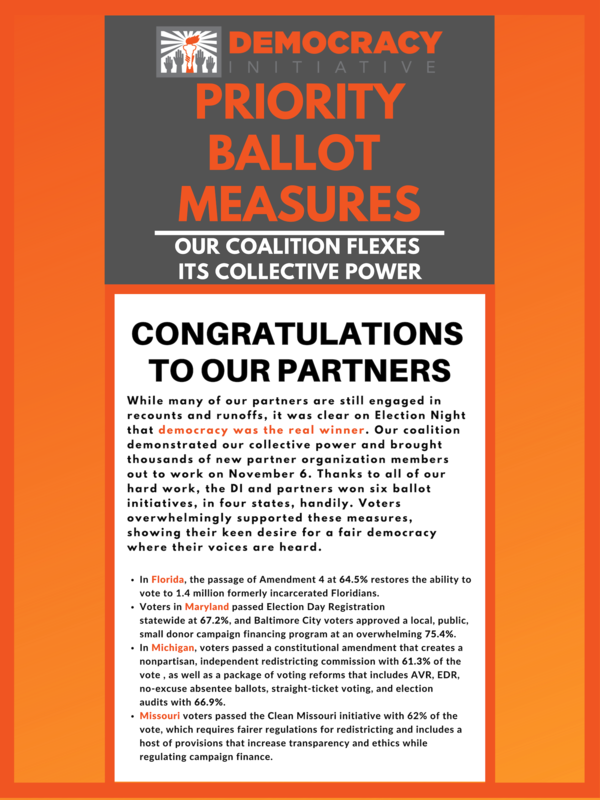 And thanks to the Democracy Initiative's diverse coalition of issue groups representing the interests of everyday Americans, and the mobilization of thousands of partner organization members, all six of the DI Priority Ballot Measures passed. Sign up and join the 60 people who have already reserved their places—spots are filling up! Don't miss the chance to participate in the DI Strategy Session, where principals and members of our diverse coalition of 69 organizations set the course for victory in 2019 and 2020. The Arab American Institute's extraordinary commitment to democracy with their contributions to election protection and mobilizing the Arab American community. And don't forget, during the week of the Annual Meeting, you also have the exciting opportunity to attend a Democracy Champions: Train the Trainer session! Democracy Champions is the foundation of our grassroots engagement program, and our Train the Trainer session will provide you with the tools to train other Democracy Champions! To RSVP to the Train the Trainer session and the Annual Meeting, click here. Finally, we need your help! Our Senior Digital Campaigner Aimée Pohl is requesting any and all photos of leaders, organizers, and members mobilizing in the field, so that we can reflect the beautiful diversity of our coalition at the Annual Meeting. Please send any submissions to apohl@democracyinitiative.org. The Democracy Initiative is partnering with Common Cause for the 6th Annual Blueprint Conference: Mapping the Path for A 21st Century Democracy. For more information about the Blueprint conference, please contact MCarpinteyro@commoncause.org. Have you heard about the White House’s plan to sell off the U.S. Postal Service (USPS)? Sounds crazy, right? But it’s true. A corporate post office would be bad for all of us. It could mean you don’t get your mail every day—maybe only every third day—even for critical deliveries like medicine or other packages. You could pay a lot more, too, especially for mail coming to or from rural areas. Universal delivery to every address in the country? Likely gone. There’s a new video that lays out the stakes—will you watch and share with your friends? Help us tell the White House that the U.S. Mail is Not For Sale! Comparison between Pennsylvania and North Carolina demonstrates how redistricting gerrymandered districts strengthens our democracy. The future of Georgia’s voter suppression rests upon the winner of the Secretary of State race. The District of Columbia is hiring a Program Manager for the launch of the DC Fair Elections Small Donor Public Financing Program with the DC Office of Campaign Finance. The DC Office of Campaign Finance hopes that an energetic, committed person applies who is passionate about getting big money out of politics, racial equity and empowering voters and small donors. The Democracy Initiative is accepting responses to our 2018 Annual Meeting invitations!